Football season is here! Check out this instant win game where you could win $15,000 in cash towards a trip to your ultimate football experience. SWEEPSTAKES: One (1) Grand Prize: $15,000 cash that winner may use towards a trip to have his/her ultimate football experience. Prize to be awarded in the form of a check. Approximate retail value: $15,000. INSTANT WIN GAME: Five hundred (500) First Prizes: $25 NCAA shop gift codes redeemable at www.shopncaasports.com. ARV: $25. 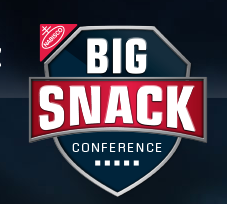 Five thousand (5,000) Second Prizes: Big Snack Conference Kit consisting of one (1) Nabisco Snack Bowl and four (4) recipe cards. ARV: $7.76.